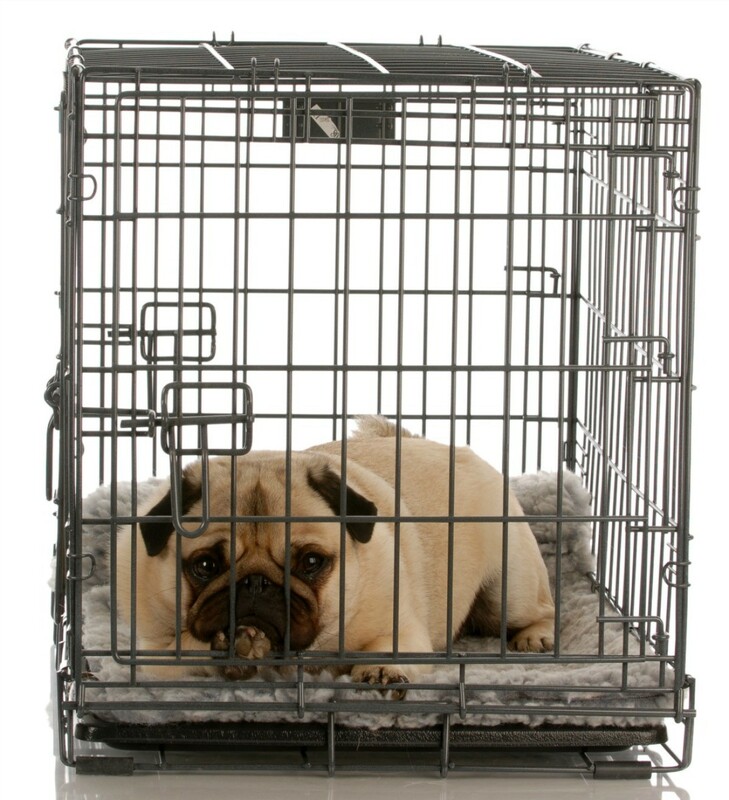 Training your dog to feel safe and secure in her crate helps not only with house training, but also, with providing an option to allowing the dog free roam of your house when you are not there. This is a guide about crate training a dog. Should I put my 1 year old Morkie in a crate when I have to go out for 1 hour? I was told just to let her run around the condo while I'm gone, but I'm afraid she will be scared. How long have you had the dog? 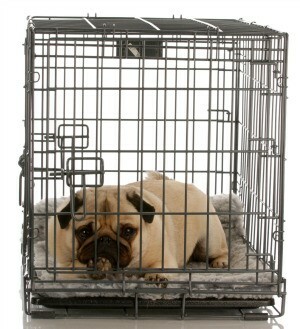 Some dogs feel safe in a cage while others feel as if they are being punished and don't know why. If the dog is new to your home then you should cage him with a soft mattress for him to lay down on and a soft toy that doesn't have any parts on it for hm to swallow. Dogs sleep 16 hours a day so being in the cage for 3 hours at a time would work. Jut don't leave him in it for 5 hours or more because he will become frustrated and that's when they start to cause problems. Good Luck. Certainly not in a small crate - I built a large pen one metre square for my dogs. I keep water, bedding & newspaper on the floor so they are free to go to the toilet if urgent. You have to think of the dog in the long run - what if something happened to you while you were out & unable to get home in time? The small crate will highly stress the dog - maybe it will overheat & also there is nowhere for water. Give some thought to a larger crate or play pen. I crate my dogs whenever I'm not around to supervise them. It keeps them safe and they don't mind it at all, and it gives ME peace of mind. When I say get in your crate, they all go in their crates. I don't use is as punishment - it's their safe place. BTW, there are water bowls to attach to the inside of the crate available at Petco or PetSmart - that way they can't be stepped in or tipped over. Question: What Crate Should I Use for Crate Training? I just purchased a cockapoo pup and I am going to crate train her. Can you recommend a crate? She is flying in so she will be in crate is that okay? Very likey it should be fine. Airlines require the animal to be able to stand up, turn around, and lay comfortably. A puppy training crate should be no bigger than that. If baby can "do" anything in the crate it is too big. Rather than buy a new crate see if you could rig box or something to take up extra space until the puppy is large enough to fill out the crate. two daily to keep them used to it. We leave the house for a few hours to shop/errands/dine and they are fine in the kennels. I have two GreatCrates for my rescued LH dachshunds. (I bought them over the internet from one of the pet places, maybe Drs. Foster and Smith?) I agree that most experts say a crate should only be large enough for the dog to stand and turn around. Since you have a puppy, you might try to find one of those crates that has a movable/removable divider. You position the divider so the dog has just enough space as described above, then move the divider to provide more space as the dog grows. Good luck with your pup! use one that goes with the size of the puppy, allowing some room for growth. place blankies,toys, snacks and chew bones inside. keep door opened, unless pup is sleeping. that way , you can combine crate traning with potty traning. i myself, paper box train. snuggles crate trained herself. when she is tired she goes into the crate on her own. when she wakes up, she needs to come out and go potty. I have a female pit bull puppy. She is only 6 weeks old am having the hardest time potty training her. When I do have her in the crate she either sleep or playing with her toys. 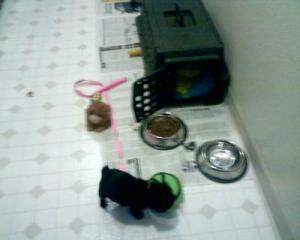 Other then that as soon as she awakes, I take her out of her crate, and place her onto her mat so she can use the potty. My Shorkie goes into a crate just while we're gone somewhere. Normally when he wakes up he goes right to his cage and runs like crazy. Is this just his saying that he's bored? I do take him out and he will just sit out there even when it is cold outside. I have to tell him to go or he would just stay in one place for 5 minutes. I believe that it's because dogs are creatures that want to please. They look to us for they're well being like feeding them etc. They love unconditionally so it's in that love for us that makes them want to please us. Not being a dog myself i can't give you the undoubted reason behind why they do what they do, i can only give you my opinion on the matter, but thats why i feel anyway, that your dog does that. It definitely could be boredom but idk if dogs get bored. Dogs aim to please, they love unconditionally and want to make us happy. I think that's why your shorkie does that. I'm not a dog myself so i can't give you a definite answer to your question, i can only give you my opinion on the matter. Idk if dogs even get bored but to me i think he's not quite sure what he's supposed to be doing and he doesn't want to displease you so he sits and waits for permission. Maybe he just normally has a laid back personality. What is a shorkie? Shorkies respond well to exercise in the form of play. If you take out a shorkie, run with him instead of walking to get him started. Don't expect him to take the lead. Shorkies are people pleasing dogs and respond well to leadership from an owner. So it could be you're expecting him to make a move while he's waiting for you to provide definite leadership on where to go. What can I do to stop my dog from pooping in her cage? I have had her for two months and she is still doing it. I do everything, but nothing is changing? Unless something happened in your home to make her upset, or unless she is sudeenly ill (vet would check for that) most likely what happened is one day she just did it, it seemed easier, she received no feedback from you that it was inappropriate, and the habit stuck. The thing to do would be to catch her in the act, and with a firm but gentle voice startle her out of it (such as by saying NO!) and then quickly take her to the pad where you want her to defecate. When she successfully completes the poo, give her praise and a treat. Dogs ordinarily do not soil where they eat or sleep. You need to call the vet on this one to make sure there is no physical problem. I am getting to my wits end. This isn't a regular problem, but it only happens every few days or so. He won't go inside the house what so ever, but he destroys everything so I can't leave him out. Instead I put him in his crate. For 3 or 4 days he will go outside and be totally normal. Then out of the blue I'll be gone for less than 3 hours and he will go in the crate. Sometimes even after he went. I have had him checked twice by my vet and it's not medical. I even had him overnighted when I went out of town for a weekend with the vet (no issues they were watching for it) and they remarked he knows how to tell you when he has to go out and is house broken. The only thing I can think of is he won't focus when we go out because he will start to mark where the cats in the neighborhood are marking (I've been paying attention) and it's only with pooping that this happens. Please any ideas? This sounds like separation anxiety. You say you can't leave him out because he destroys things (also a symptom of separation anxiety) and so you put him in his crate. Do you mean all day long when you go to work? Dogs are social animals. They need to be with people. They require mental stimulation, play, and exercise just like all mammals. Your dog simply can't handle being in "doggie jail" all day long. And then when you leave to get groceries, run errands, or just go out to do what you want to do, he's in there again. At the very least, hire somebody to walk your dog and play with your dog for about 2 hours per day while you are gone. What it probably really needs is to stay with someone else during the daytime, or doggie daycare. I agree with Abigail, this is separation anxiety. Many breeds cannot mentally tolerate crating for long hours. Find a doggy daycare and make that available for your dog 3 days a week (or more if you can afford it). You will see a big difference.